My son and his wife are expecting a baby girl next month and one of my daughter-in-law’s closest friends, Katie, hosted a baby shower for her. 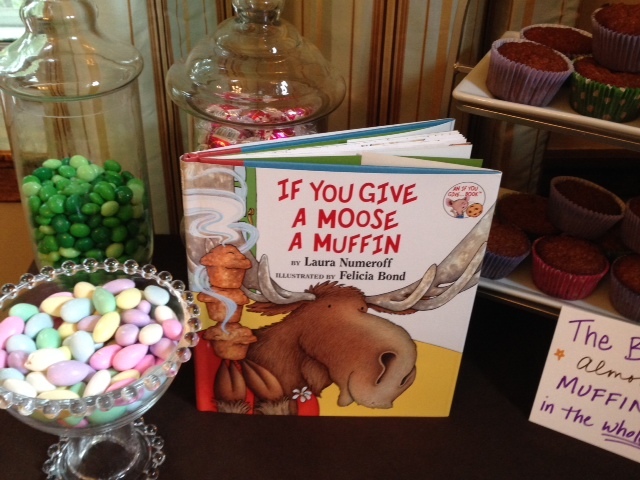 I was pleased when the invitation arrived and I saw that it was a “book shower.” Every guest was asked to bring a children’s book in lieu of a card. Of course, I thought a natural addition would be bookplates! When I contacted Katie, it turned out she had just looked at Bookplate Ink’s bookplates on Etsy! Since the shower was for my future granddaughter, I created a new bookplate for the shower. A version of this bookplate is now available on Bookplate Ink’s website. 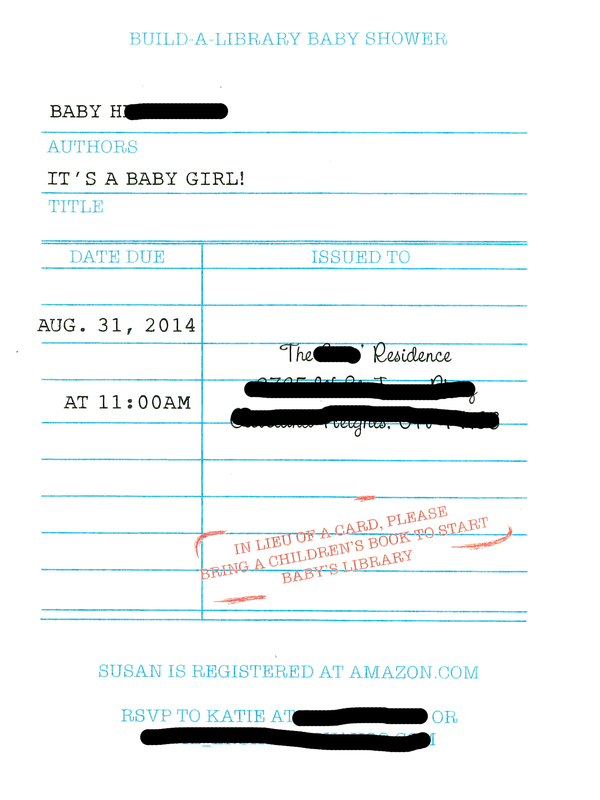 Bookplate Ink has printed bookplates for customers’ baby showers, but I had never been to a book shower. I was very impressed with the way Katie put the shower together and thought it would be fun and helpful to share her ideas. Everything about the shower was related to books. Classic children’s books were displayed around Katie’s dining room, all related to one of the food dishes she had prepared. For example, Dr. Seuss’ famous Green Eggs and Ham was paired with muffin-size egg soufflés. Stinky Cheese Man and Other Fairly Stupid Tales sat by a tray of cheeses, and If You Give a Moose a Muffin was displayed next to a tray of almond muffins. In the kitchen, there were a variety of beverages, including Pinkalicious spa water and Bear’s sangria, both based on children’s books. For coffee, Katie had white mugs on which fun literary messages had been printed with a Sharpie marker. In another room, K atie had a desk set up with a wonderful, creative guest book. The pages were removable to allow guests to write a message to the parents, decorate with a variety of stickers, and slip the paper into a plastic sleeve in the book. I put the bookplates here to allow the guests to fill them out before putting them with the books they brought. It would be easier to send baby shower bookplates to your guests along with the invitations, but we didn’t have a chance to coordinate this. Katie also had a cute game for guests to play, called Children’s Book Scramble. The idea was to figure out which children’s book title was described in the obscure description. For example, the answer for “Locale of the Untamed Creatures” was the book Where the Wild Things Are by Maurice Sendak. Overall, the shower was a huge success. The guests all seemed to enjoy the book theme and the books were a wonderful conversation piece. The best part is that my future granddaughter already has a wonderful library of books, complete with bookplates that have a loving message from her friends and family. It all started with the bookplate shown here. 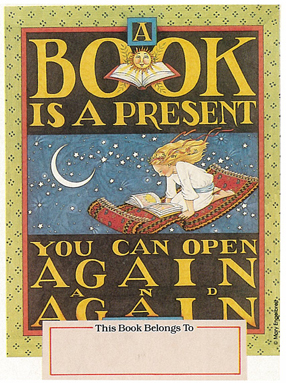 This bookplate, with artwork by renowned illustrator Mary Engelbreit, was printed by the Antioch Company in the 1990s. As the Antioch Company has now closed, this bookplate has been out of print for many years. Recently, we received an e-mail from a potential customer asking us to print these once again. I contacted Mary Engelbreit Studios and was pleased to learn that they often receive requests for bookplates with their artwork and had just received yet another. And, thus, a wonderful new relationship was formed. Bookplate Ink will soon offer a gallery of designs by Mary Engelbreit. Some of these will be designs previously printed by the Antioch Company, but others will be new bookplates. We will offer these in both personalized and non-personalized formats. Spark a love of reading in a child you know with a bookplate specially printed with his or her name. Or order a set with no name added for a lower priced option. Many children and adults prefer to enter their own name and, thus, personalize their bookplates themselves. As we launch this new gallery of Mary Engelbreit artwork, we will also begin to offer all of our non-personalized bookplates in smaller quantities of 20 bookplates for a truly affordable gift. Order ahead for birthdays, Christmas stocking stuffers or a special gift for grandchildren! Please check the Bookplate Ink website and this blog for the launching of this exciting new line of bookplates. One of the fun aspects of printing bookplates is discovering the creative ways they are being used. 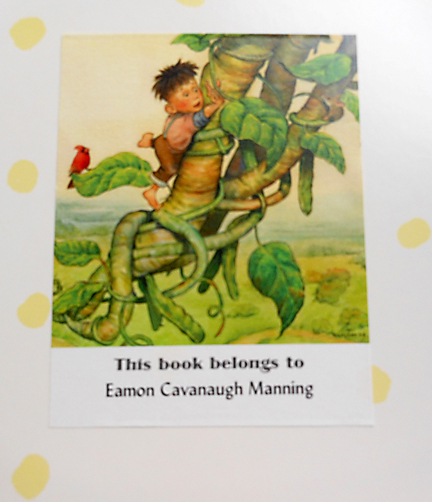 In particular, I love hearing about wonderful ideas using bookplates to encourage children to read and to love books. Other schools have a birthday book club. On students’ birthdays, a book is donated to the school library in their honor. 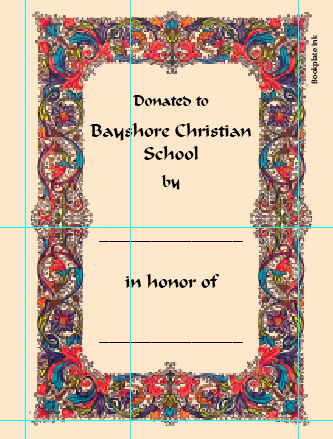 Often, a simple border design, perhaps with the school logo and room to add the child’s name, is used. Imagine the pride of young students when they see a book in their school library with their name printed as the donor. I used this same idea recently when a friend had her first child. I bought a couple of children’s books that I love and inserted one of my favorite bookplates with the baby’s name printed on them. I included a box of the same bookplates for use with other books. The bookplate I chose, design JH100, features an illustration from the classic fairytale Jack and the Beanstalk, created by artist Jim Harris. This was a recent addition to our gallery that I’m thrilled to offer. Jim is an American illustrator currently living in New Zealand. His books have sold over 3,000,000 copies, including award-winning titles such as Petite Rouge, The Three Little Javelinas, Jack and the Giant, and Ten Little Dinosaurs. Jim also creates art for private collectors and corporate clients, including the Franklin Mint, IBM, Chicago Tribune, and National Geographic Books. You can see more examples of his work at jimharrisillustrator.com. And finally, an additional idea for children was brought to my attention by a comment on this blog. A delightful new customer, Susie Champion, explained that she adds a personal message on the bookplates in books she gives her grandchildren: “Just a note to tell you how important your bookplates are to my grandchildren. Every book I give has an Antioch plate inside. I write a personal anticipatory note about the story’s importance, adventure, life lessons, or pure fun and silliness. In simple ‘kid talk,’ I explain why it’s tailored to that particular child. So the books have piled up over almost five years between two families. Both daughter-in-laws have told me how they have been severely reprimanded by four- and two-year-olds at story time because, ‘That (the first page of the story) isn’t the beginning! You have to start reading at the beginning Mom!’ Your bookplates with their personal message, after the title on the cover, are now the beginning for all my grandchildren. Thank you so very much.